Sandalwood is a fragrant wood that is made of fine-grained dust and it produces an oil that has a strong mesmerizing fragrance. The oil and the powder find a variety of cosmetic uses since it helps in enhancing the glow of your skin and giving you a flawless complexion. It has powerful antioxidants that help in slowing down the signs of aging and has anti-inflammatory properties that help in soothing the skin. You can use sandalwood powder for bathing, in face packs and use the essential oil in an oil massage. But the best way to get all the beauty benefits of sandalwood is to start using a sandalwood soap that has all the goodness of this medicinal plant. That way, each time you have a bath, you can derive all the benefits of sandal from the soap. Here is our pick of the best sandalwood soaps in India. The iconic sandal soap from the Karnataka Soaps and Detergents Limited is a premium soap that has sandalwood oil as one of its main ingredients. It is great for improving complexion and also has antiseptic properties. The soap helps in soothing prickly heat and other skin irritations. Regular use will give you pimple free skin. The soap has a strong sandalwood fragrance that will stay with you through the day. It is priced at Rs. 49 for 125 gm. 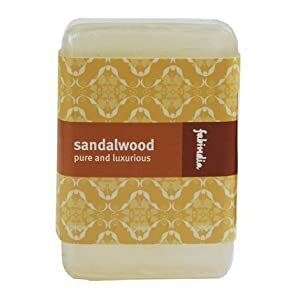 The Fabindia Sandalwood Soap is a soap with a mild lingering fragrance that will make each shower a spa like experience. The soap gently cleanses your skin while also pumping it with lots of nourishment. It retains the natural moisture of the skin and leaves it glowing. It is priced at Rs. 75 for 100 gm. The Vivel Luxury Sandal Creme Soap is enriched with sandalwood oil and milk butter. The rich formulation lathers into the skin and gives you a soft radiant glow. Sandalwood, known for its cleansing properties gives you a super clean feeling after the bath and leaves you smelling great. The milk butter conditions your skin and keeps it soft. It is priced at Rs. 25 for a 75 gm bar. 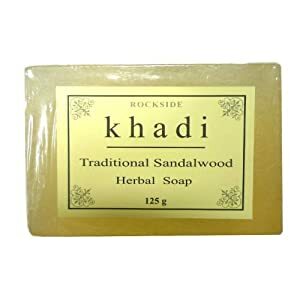 Khadi Traditional Sandalwood Soap is made of glycerin, sandalwood oil and vegetable oils. The sandalwood helps in rejuvenating the skin and keeping it fresh. The soap is priced at Rs. 75 for a 125 gm transparent bar. The Soil and Earth Sandalwood and Turmeric Soap is made from the cold pressed method with natural extracts and pure essential oils. The soap contains the double power of sandalwood and turmeric to help fight the blemishes on the skin and to condition it. It is made from a glycerin base which keeps the skin soft and supple. It is priced at Rs. 85 for 125 gm. The Medimix Sandal Soap is a variant of the popular Medimix Ayurvedic bath soap. It is made from a mix of sandal and eladi oils which effectively works on blemishes, dark spots and pigmentation. Regular use gives you clear and blemish free skin. The soap is priced at Rs. 36 for 125 gm. The Mysore Sandal Millennium Soap is a more luxurious variant of the traditional mysore sandal soap. This soap comes enriched with Shea Butter, jojoba oil, hydrolyzed milk protein and natural sandalwood oil. It helps in rejuvenating the skin and making it radiant. It is priced at Rs. 750 for 150 gm.